The “Shark Tank of Wellness” student competition is a unique global challenge that rewards students for their most innovative, impactful ideas for the wellness industry. Help us spread the word by hosting a banner on your website or by sharing on your social media accounts! Click here to download the different graphics available. We define the wellness industry broadly and are looking for innovations in sectors as varied as architecture/design, beauty, education, fitness, hospitality, investment, medicine, nutrition, real estate, spa, technology, travel, tourism and more. Students are to submit a concept submission form detailing their idea and a one- to two-minute video presentation of their idea. The wellness industry is currently valued at over $4.2 trillion, thus providing ample opportunity for students with great ideas! 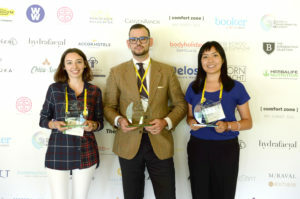 Three finalists will be flown, along with their professors, to the annual Global Wellness Summit (GWS) being held October 15–17, 2019, at the Grand Hyatt Hong Kong. Here, they will pitch their business idea to the attending Summit delegates—a “who’s who” in the global wellness world. Several business leaders will act as “Wellness Sharks” and ask questions of the students, who will defend their innovation and make a business case for its feasibility. The first, second and third place winners will then be announced on stage during the Global Wellness Summit. May 31, 2019 (12:00 p.m. Eastern Time): Competition closes. All submissions, both the Concept Submission Form and video, must be submitted by this time. Late submissions will not be accepted. August 15, 2019: The top three concept submissions, as decided by the judges, will be announced by email to all registered participants. Arrangements will then be made to fly each of the three student finalists and their professors to Hong Kong for the Global Wellness Summit, October 15–17, at the Grand Hyatt Hong Kong. October 15-17, 2019: The “Shark Tank of Wellness” finalists’ presentations will take place on stage at the 2019 Global Wellness Summit. Students will pitch their ideas to the judges (a.k.a. “Wellness Sharks”) and the Summit delegates. The first, second and third place winners will then be announced on stage, at which time, the prizes will be awarded. The winners will be listed on the Global Wellness Summit website and promoted on social media post-Summit. 1. REGISTER for the contest online: Anyone interested in participating in the competition must register by completing the Entry Form. Only registered contestants will receive the necessary information to complete the submission process. 2. SUBMIT a Concept Submission Form AND Video Link no later than May 31, 2019. The information necessary to submit these items will only be sent to those who register for the competition. The Concept Submission Form consists of several questions regarding the wellness idea and its viability. The video should include a presentation of the wellness idea, focusing on why the innovation could positively impact the wellness industry. The video must be one to two minutes in length; any videos outside this length will be disqualified. Videos must be uploaded to a public platform, such as YouTube, Vimeo or Dailymotion. The video must contain only original work and not be subject to any copyright restrictions. All entries become the property of the Global Wellness Summit, which retains the right to publish the entries in all media formats, including but not limited to print, digital and broadcast. Entry creators and the GWS will be acknowledged in all published versions.See Official Rules. The competition is open to both individual students and teams of students over the age of 18 from anywhere in the world. There is no entry fee. Note: If participating as a team and the team is chosen as one of the top three finalists, only the team leader will be eligible to attend the Global Wellness Summit with their professor. The contestant(s) must be an undergraduate student (working toward a one- or two-year diploma, a four-year Bachelor’s degree or a Vocational Education and Training (VET) qualification) or a graduate/postgraduate student (working toward a Master’s, MBA, JD, MD or PhD degree) in a university or college of distinction at the time they develop and submit their concept. The contestant(s) must be either a full-time or part-time student at the university or college. The contestant(s) must have a professor or faculty advisor who serves as a mentor for their project. All contestants must be available to attend the Global Wellness Summit, October 15–17, 2019, in Hong Kong, in order to present their idea in person. Click here for answers to frequently asked questions about the Shark Tank of Wellness global student competition. First Prize: One (1) first-prize winner will receive USD $5,000. Second Prize: One (1) second-prize winner will receive USD $3,000. Third Prize: One (1) third-prize winner will receive USD $2,000. Additional noncash prizes include airfare and hotel accommodations in Hong Kong for the top three student finalists (individual or team leader) and their professors. Also included is access to the three-day Summit (a $3,630 value), including all general sessions, breakout discussions and industry forums, featuring global industry leaders. A myriad of social events and a final evening gala is included. This is a priceless opportunity to meet and learn from global visionaries. See Previous Shark Tank of Wellness Top Finalists here. For additional information, please review the Shark Tank of Wellness FAQ’s or contact Kate Sornson.